My father, Lawrence Lee, was born on 18th September 1909 and brought up in Weybridge where his father owned a garage near the Brooklands Race Track (then very new, it had been opened in 1907). He left school at 14, but his artistic talent had been recognised by one of his teachers who got him a place at Kingston Art School, from where he progressed to the Royal College of Art and to an art teaching post at Bromley Art School. In the meantime his parents’ acrimonious divorce saw him move with his mother to New Malden where, at the Methodist Church, he met Dorothy Tucker. It was an immediate love match which endured many visissitudes up to their eventual marriage in September 1940. It was probably only the coming war against Fascism, in which my father felt impelled to fight, which stopped him from taking up the monastic life for which he thought he had a vocation. During WW2 he first joined the Royal Army Medical Corps, but transferred to the Royal Artillery and served as an anti-aircraft gunner for a while. He then fought in the North African campaign with the rank of Captain, being involved in the heavy fighting at the Kasserine Pass. There followed the invasion of Italy, where he took part in the landing at Salerno (ending up in the water at one point) and then the fighting up to Rome. He was then transferred to the Army Educational Corps (with the rank of Major) as an expert in artistic and cultural affairs. This being in one of the artistic centres of Italy, he had a wonderful time and made full use of the opportunity. On his demob and return to Britain, he was offered a job with Martin Travers, who he had known before the war. Travers ran a design and craft business which specialised in church furnishings, including stained glass. It was probably also Travers who was instrumental in getting him the part-time post of Head of Stained Glass at the Royal College of Art. Martin Travers died suddenly and unexpectedly in 1948, leaving many commissions which my father completed, and which propelled him into setting up his own studio. 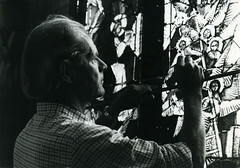 War-damaged church windows provided a steady workload, and the commission to design and make the nae windows for Coventry Cathedral (he collaborated with two of he ex-students, Keith New and Geoffrey Clarke, but was in charge of the project) brought him to wider notice. My father operated consciously in the tradition which could be traced back to the great medieval church buildings and their glorious stained glass windows. He therefore took on ‘apprentices’ (modernised to ‘assistants’) who worked in his studio for a time before setting out on their own. Their contribution was recognised by adding their initials to his own signature at the bottom of most of the windows. He was fascinated by the possibilities for using glass in new ways opened up by improvements in modern adhesives; and in all forms of glass, including thick slab glass which could be set in concrete. he eagerly took up secular commissions as a relief from the constant pressure to adhere to the somewhat conservative treatment he was often compelled to use in church work (but which he was able to radically adapt in many fine windows). My father worked constantly into his eighties, completing his last big church window in 1991 (at Brasted in Kent), and his last ever window, a memorial to his grandson Alex, in the library of Chew Valley School in 1994. He celebrated his 100th birthday with a party attended by family, friends and former assistants, on 19th September 2009.